Congratulations to the following students who won at the Tuolumne County History Fair. 1st Place - Teagan Spangler and Kirah Levering. Their exhibit was nominated to go onto the State History Fair. 1st Place - Miranda Bendix. 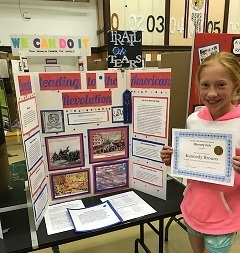 She was nominated to go onto the State History Fair. You have made Soulsbyville School proud! GO FALCONS!!! A big thank you to all students for all your hard work and support!